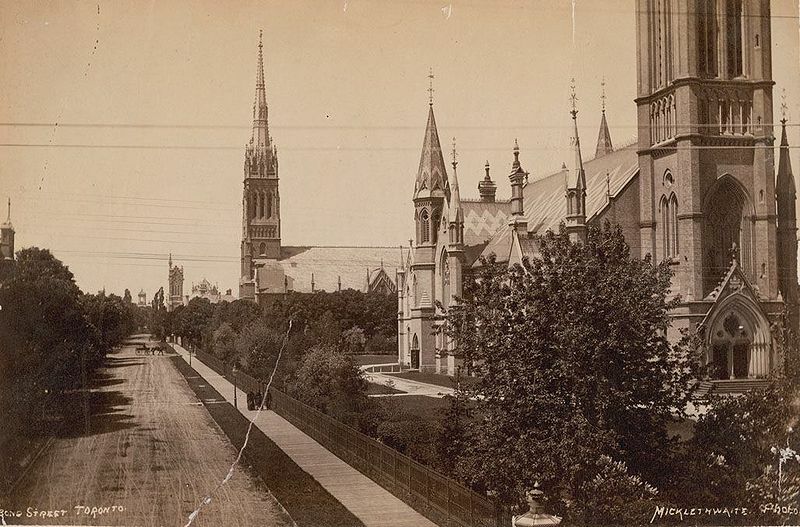 Historic photo of St. Michael's Cathedral and Metropolitan United. How plainly visible is Providence in the history of my soul and of my life! It must be the same for all, if one knows how to discern its beneficent action; when I look back, in spite of misfortunes and tears, I can only bless and adore. I begin this new period of life – long or short, calm or sorrowful, according to God’s will – with these words from the depths of my soul: I believe, I adore, I hope. The photograph above depicts portions of 4 old churches, not just two. In the distance up Bond Street can be seen St. James Square, Presbyterian on the N. side of Gerrard St E. I've seen an extremely rare photograph of the interior of that church taken about 1905. On the extreme R. of the photograph can be seen an ornament of a building that faced the side of Metropolitan Meth. ; Bond Street Baptist Ch. built 1848 and sold by auction to the 'catholic church' in 1875 after the congregation moved out and re-established themselves as Jarvis St. Baptist Church. A legend exists that the Baptist Ch. got a better than usual price for their old building as the "catholics' accidently sent two agents to bid on the property and ended up bidding against each other! I don't believe it and I think the story became "fact" for the sake of consoling Baptists who were horrified with the thought of selling to the Catholics--a sentiment and way of thinking that exists to this day in that church. The front doors of this Church were placed exactly where the main entrance of St. Michael's Hospital exists on Bond Street. The "catholics" re-deployed the old Baptist church for various uses and added a second story. A fire destroyed that building in the 30's and a firefighter was said to have broken through the old baptistry by accident and been completely immersed in collected water from the fire hoses! Interestingly, the hospital chapel now occupies the old footprint of the Baptist church-albeit on the 2nd floor. While this work was done, Jarvis St. Baptist was being rebuilt after they suffered a fire in 1938.